A feature story in the June 15, 2017 issue of the Journal of the American Veterinary Medical Association (JAVMA) about federal legislation and student loan debt spotlights the circumstances facing William Willis of the Purdue DVM Class of 2020. Entitled "AVMA looks to Congress for Student Debt Relief," the article by R. Scott Nolen recaps the AVMA's ninth annual Legislative Fly-In, which was held April 23-25, with 92 participants, including William. The story describes how William and the other Fly-In attendees heard from veterinary policy experts and spoke to their elected representatives about pending legislation that would offer some relief for veterinarians' educational indebtedness. In the article, William is introduced as a veterinary student from Anchorage, Alaska, who can't remember a time when he didn't want to be a veterinarian. Yet, with no veterinary school in his home state, he enrolled at the Purdue University College of Veterinary Medicine and became one of four PVM students in the United States Department of Agriculture Multicultural Scholars Program (USDA-MSP). The USDA funded initiative provides partial scholarships to the scholars, specific leadership and professional development opportunities designed to enhance scholar experience and retention, and supports their participation in a Special Experiential Learning Experience (SEL) such as study abroad. William hopes to return to Anchorage after graduation to pursue his particular interest in veterinary practice involving exotic production animals, such as reindeer and musk ox, as well as wildlife. The prospect of graduating with some $150,000 in student loan debt, however, may mean he has to defer those plans. "The high cost of living in Anchorage and the limited amount of mixed animal practice opportunities there, coupled with my student debt, may make it financially unfeasible to return home," William is quoted as saying. "Alaska has a need for veterinarians in all disciplines, but my debt load may make me reconsider my focus or change where I practice." The article goes on to state that William's plight is symptomatic of the high price of veterinary education in America. The 2017 AVMA Report on Veterinary Markets showed that the mean debt incurred by 2016 veterinary graduates while they were veterinary students was $141,000, while the mean starting salary for new veterinarians was about $73,800 for a full-time position. Responding to growing concerns over veterinary student indebtedness, the AVMA, the Association of American Veterinary Medical Colleges (AAVMC), and veterinary colleges have coalesced around the Fix the Debt initiative, which is a national campaign encouraging lawmakers to ease the educational debt burden and make the federal student aid system more amenable to the needs of veterinary students and recent graduates. 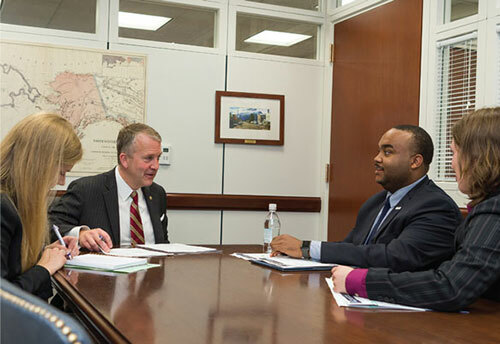 The participants in the AVMA Legislative Fly-In focused on two bills as they met with their representatives: the Veterinary Medicine Loan Repayment Program (VMLRP) Enhancement Act and the Higher Education Act (HEA). The first is bipartisan legislation that would repeal the tax on a Department of Agriculture program that pays off up to $75,000 in student loan debt for veterinarians who spend three years working in underserved areas of the country. More than 350 veterinarians have been placed in 45 states, Puerto Rico, and U.S. federal lands since the VMLRP's implementation in 2010. According to the JAVMA article, William sees the VMLRP as a way he can bring needed food animal veterinary services to underserved Alaskan communities without going further into debt. "Alaska currently has five VMLRP positions—all deemed as high to critical need, which have never been filled since the program was enacted. Personally, I am considering participating in this program when I graduate," William is quoted as saying. The HEA dates back to 1965 and provides for the administration of all federal loan assistance for students in postsecondary education. Up for reauthorization in 2013, the legislation has yet to be renewed. The JAVMA article also quoted AAVMC Director of Governmental Affairs Kevin Cain who said, "Lawmakers will introduce legislation throughout the 115th Congress dealing with some aspect of higher education so it is imperative that veterinarians and aspiring veterinarians become engaged in the fight to save financial aid for current and future students." Click here to view the complete JAVMA story.